Thel, Ort and Jeff prepare to experience the strong ales and lagers. Owen Ogletree (director of Brewtopia Events LLC) gathered together fellow beer lovers Lari Cowgill, Kerri Allen, Thel Melton, Ort Carlton (writer for Flagpole Magazine), and Jeff Rapp on March 24, 2005 at Copper Creek Brewing Company in Athens, GA to sample and comment on several strong beers from American craft microbreweries. This sampling was done as a blind tasting where no one was aware of the brands that were being served. 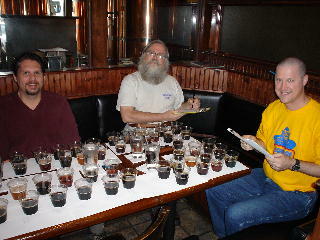 Products were informally commented upon and ranked according to Beer Judge Certification Program (BJCP) style guidelines. First, second, third places, and honorable mentions were awarded to the products we felt represented their individual styles in extraordinary fashion. Drop Owen an email to share your comments and opinions. Aroma: Great malt aroma with Munich malt notes and a hint of dark fruit. Melanoidin, toasty malt nose is pleasing. Appearance: Dark chestnut / amber with a good stand of foam. Flavor: This rich lager is very bready, toasty, and malty with caramel / toffee tones and a sweet finish. There are no off flavors in this beer - it is clean with lots of German malt complexity. Well made and almost chewy. Aroma: Oak, vanilla, maple syrup, alcohol, cognac, honey, dark fruit. Appearance: Clear with a dark gold / amber color. No carbonation. Flavor: Extremely complex flavors of rum, whiskey, dark malts, maple, toffee, oak, and vanilla. This strong beer is well balanced - no one flavor overpowers the others. The finish is very woody. An amazing brew. Aroma: NW American hops, coffee, slight fruit. Very pleasant aromas that are well balanced. Appearance: Jet black and opaque. Flavor: Hop character balance with dark malts is wonderful. The American hop flavor is elegant and smooth, and the mild bitterness goes well with the dark malts and alcohol notes. This beer has a soft, pleasing mouthfeel and no off flavors. This is an interesting and well-crafted recipe. Unique and creamy, yet rich and flavorful. Aroma: Intense, resiny NW hop aroma that is quite grapefruit like. Hop aroma is smooth, mellow, and clean. Appearance: Medium reddish with an orange tint. Very clear with mild carbonation. Flavor: Balance here is toward the hops. There are fruity notes of apricot and a very strong hop flavor that is bold and intense. There are floral, citrus overtones from the use of American hops. A tiny hint of medicinal character emerges as the beer warms. Overall, quite a hoppy experience. Aroma: Peaty, roasty, and earthy with caramel notes. Appearance: Clear and dark brown with ruby highlights and mild carbonation. Flavor: Medium mouthfeel - lighter in body than we expected - needs more viscosity? Coffee hints with a touch of smoke. Malt flavors are a bit thin, and this beer would be better with more intense malt flavor and a bit more sweetness. Aroma: Coffee, earthy notes with a slight hint of cheese. Flavor: Winey, sour notes predominate. There are vanilla flavors from the use of oak, but the acetic/lactic tartness covers up most of the complexity of this ale. Roasty notes emerge in the finish. Aroma: Smoky, herbal, coffee, roasted malt character. Appearance: Dark black with a rich brown foam. Flavor: There is a hint of astringency here. The oak finish is pleasant, but the beer has a charcoal-like flavor. It is a tasty brew, but could use more malt richness to balance the oak and roasty bite. Hops are noticeable in the bitterness as well. Aroma: Coffee with apple, fruity, chocolate notes. Appearance: Dark brown with ruby highlights and a nice tan head. 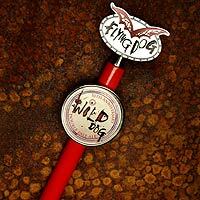 Flavor: This smooth ale has flavors of caramel malt with some chocolate and herbal character. We wished for more malt and dark grain complexity. Overall, a very well made and pleasing Porter. Aroma: Dark fruit, alcohol, chocolate, caramel, menthol. Most of these aromas are mild. Appearance: Oily and viscous with black color and thick brown foam. Flavor: Sherry hints with lots of dark malts - not very bitter, however. Tastes of chocolate, alcohol, and slight fruity esters. A dry, clean finish. 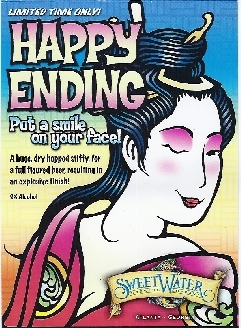 Aroma: Pears, apples, citrus, yeast, phenols, and a hint of solvent. Appearance: Deep gold with a bright, white head. Flavor: This is a smooth beer with no hot alcohols. There is a cidery hint that is slightly fruity and tart. The mouthfeel is soft and creamy. A good beer for its style, but could use more crisp, spicy, peppery character and less fruitiness. Aroma: Plums, black cherries, sherry, hop hints. There is a definite alcohol, herbal quality to the smell. Appearance: Thick, dark foam. The beer is very black. Flavor: Creamy mouthfeel with complex flavors of plum, chocolate, hops and roasted malts. There is a medium/full body with a hint of hop bitterness. Very smooth for its strength. Aroma: Caramelized, burnt sugars and hints of alcohol and solvent. Appearance: Very black and oily in appearance. Flavor: Roasty, chalky, alcohol-like flavors combine with chocolate, fruit, and some hop bitterness for a tasty, well-balanced strong Stout. There seems to be some astringent / acid notes in the flavor (almost tar-like). This is an intense, rich, dark ale with a dry finish.